Volunteer Director of the Thoroughbred Education Foundation Inc. Tracy Wachbrit preps a horse to get brushed in Moorpark, Calif. on Nov. 23, 2014. For most people, a film rarely changes their outlook on life. But after watching the movie “Seabiscuit,” a Pierce College pre-veterinary science major developed a passion for thoroughbreds and brought awareness to the community about the problems surrounding the racing industry. horse rehabilitation, but also in spreading awareness about the foundation’s program to prevent the horses from being killed after their racing careers end. Eventually, Wachbrit went to North American Racing Academy in Kentucky where she enrolled in a training program for jockeys and horsemen, wishing to become a racehorse trainer. Yet, after being told multiple times to pursue being a veterinarian, she decided to give it a chance and enrolled in the pre-veterinary program at Pierce, ultimately aiming to become a public health vet. During her time at Pierce, Wachbrit has worked at a racetrack where she ended up injuring her knee and had to retire from the industry. Missing the horses after a few months, she found information about the Foundation in a magazine, reached out to them and offered to volunteer. “It’s a confusing program for people when they first hear about it, because when you think about it, it sounds like a rescue. And in all effects and purposes it is, we just mostly rescue by prevention,” Wachbrit said. Ken Lian and Sheryl Fulop, founders of the Foundation, created this non-profit organization after they noticed the negative changes in the horseracing industry over the years. “Tracy has played a big role in bringing students down and really teaching them our core solution based measures. 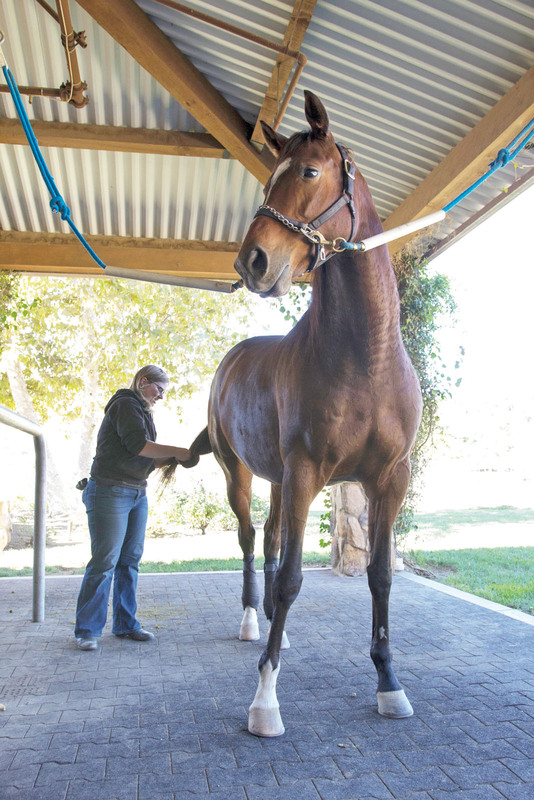 From moving away from the rescue paradine as the solution, to a more realistic one,” said Ken Lian, a veterinarian and founder of Thoroughbred Education Foundation. Many young horses’ lives are being cut short due to poor treatment and care as a result of horse races. They tend to not receive the proper training. They are kept in their pens for a majority of their lives, treated poorly by owners and when they become injured or “useless” they wind up being auctioned—often bought by people who will sell them as meat. Currently, there are no functioning horse slaughterhouses in the United States due to a ban that removed funds for federal inspections of facilities that are required to operate. Yet horse slaughter still remains a problem. The Foundation also focuses on informing society of humane education. “Tracy is an ambassador at school for the program and was one of the people that encouraged to bring me here, and now I even started my own non-profit,” said Gabrielle Melville, a registered veterinary technician major at Pierce. By informing others about retired or injured horses being useful after racing can give the community a different perspective on teaching others compassion and not seeing them as an expendable object. “Being nice to animals is an important factor of humane education, but also by exploiting them in a good way, such as bringing an retired or injured animal to a classroom, helps teach empathy and passion to the students,” said Bob Ferber, a retired government animal cruelty prosecutor. With the multitude preventative measures the foundation encourages, they do all that they can to spread the word. “We are trying to bring in educated fans into racing. Maybe a few are corrupt and are in it for the money, but for me it was the horse, its always been about the horse. If it wasn’t for them, I wouldn’t have stayed in this industry,” said Wachbrit .